Assuming supply is not an issue and Acell+Plucked hairs pans out, what kind of densities can we achieve with plucked hairs? 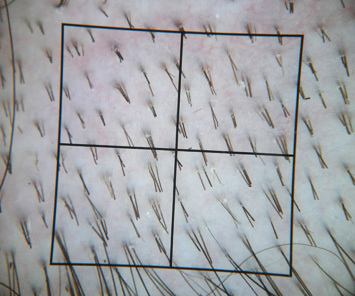 Consider the fact that normal scalp follicular units contain 2.3 hairs per unit. And are spaced out relatively evenly. 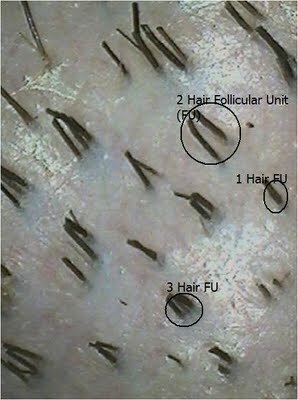 Assuming plucked hairs only produce 1 hair, would spacing them closer together create a similar density to follicular units? » together create a similar density to follicular units? btw - Did you take your posted photos with your camera? » btw - Did you take your posted photos with your camera? I got the images from a google search. LOL… u seriously think you are sooo knowledgable… and at the same time you are impressed by a graduate level degree in Physics… you sir are nothing but hot air… u seem to have NO scientific background but seriously seem to believe that u’ve understood it all simply because you are fairly skilled at googling (or perhaps you simply spend half the day doing so) and have read a few publications (which you can not have understood without a scientific background)… we were doing just fine before you came to this board… and we do not need your enlightenment… now go crawl back under your rock. Have we seen any real proof that implanted plucked hair really works? » Have we seen any real proof that implanted plucked hair really works? Frankly, I really wonder … no, nobody ever has seen anything. well unless you think Dr Cooley a well respected doctor would do a presentation full of lies infront of his peers at an international hair restoration event organised through the leading professional body, you would presume that implanted plucked hair grows if not he would have destroyed his reputation forever. however, i understand what you mean in that has it has to be verified independently by others. there are some doctors doing their own trials so within a few months we should at least have some information. in the meantime i will assume that autocloning does grow hair which can be seen in one of Dr Cooleys presentation slides. » destroyed his reputation forever. » one of Dr Cooleys presentation slides. What would convince me would be several NW7 going back to NWI. As the donor is unlimited it would have to be a complete restoration. Maybe in several steps but compelte coverage after all. » steps but compelte coverage after all. yeap it will take at least 4 passes before a Norwood 7 becomes a 1 back to original density assuming 1 plucked hair to 1 new hair. allowing time to regrow the plucked hair from the donor about 2 years to complete so we wont be seeing a picture of brand new norwood 1 for a least a few years. probably wont be cheap either. » » steps but compelte coverage after all. » be seeing a picture of brand new norwood 1 for a least a few years. » probably wont be cheap either. » » » steps but compelte coverage after all. » » be seeing a picture of brand new norwood 1 for a least a few years. » » probably wont be cheap either. Assuming that plucked hair regrows normally i believe even a restoration to 65% to 70% would look fantastic. ACell may not be the optimal treatment people would wish for but for smaller scale norwood patterns 3 to 4 for example this would be and end t0 baldness for them in my opinion. Again this is assuming that ACell works and the variables are all positive. You could also use a FUE megasession BUT combine this with acell in both onor and recipient side (with a little more fine tuning you can get infinite donor). And then it wouldnt actually take for to 5 treatments for a NW7 class person to get back to NW0 or NW1 with high density. » » » » steps but compelte coverage after all. » » » be seeing a picture of brand new norwood 1 for a least a few years. » » » probably wont be cheap either. » this is assuming that ACell works and the variables are all positive. yeah your probably right, an older NW7 would probably settle for even 50% because his friends with heads of hair probably wouldnt be much beyond 50% of their original hair anyway, but his young son who is a NW6 has to hang out at the beach amongst NW1-2’s will probably not settle for anything less than 70% and then some. » person to get back to NW0 or NW1 with high density. perhaps, but there is only one doctor so far claiming more hairs growing than what was transplanted, so it would be good if others could try to replicate this and prove that it occurs. » » » » » steps but compelte coverage after all. » » » » be seeing a picture of brand new norwood 1 for a least a few years. » » » » probably wont be cheap either. » » this is assuming that ACell works and the variables are all positive. » than 70% and then some. » » » » » » What would convince me would be several NW7 going back to NWI. » » » » » » steps but compelte coverage after all. » » » » » probably wont be cheap either. » » » example this would be and end t0 baldness for them in my opinion. » » » this is assuming that ACell works and the variables are all positive. » » than 70% and then some. total of about 4 years at a cost of about $250,000 if you assume each graft cost $8 (FUE price). this isnt cheap so most NW7’s wont go for full density unless automation drives the cost lower or an alternative HM solution comes along which is more likely. » » » » » » » What would convince me would be several NW7 going back to NWI. » » » » » » » steps but compelte coverage after all. » » » » » » probably wont be cheap either. » » » » example this would be and end t0 baldness for them in my opinion. » » » than 70% and then some. » cost $8 (FUE price). cost is not something that i am to worried about at this stage. the most important thing is that it works. Even if a total cure was to be realeased tomorrow at a cost of a million per go its still a massive breakthrough cause medically at the moment we have nothin. Who knows it may even be cheaper than normal HT.